A Wallpaper changing program. select a folder with your images,Set Style (centered/stretched/tiled) and the time Between changes. install included so it will start automatically every time you start windows. 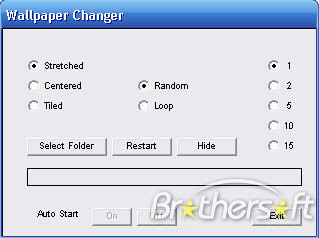 (valid formats bmp,jpg,png,gif) you can free download Paper Changer 1.0 now.